This article was originally published on the OHIO College of Arts & Sciences Forum. To view the original article click here. 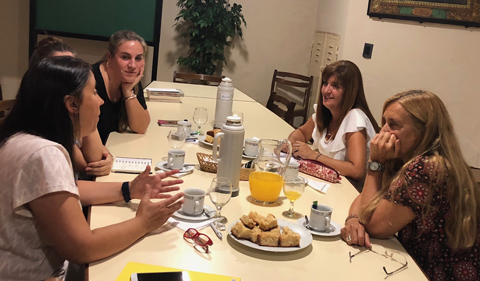 Dr. Muriel Gallego, Associate Professor of Applied Linguistics-Spanish in Modern Languages, participated in the 2019 opening meeting of the inter-institutional, international Faculty Learning Community/Comunidad de Aprendizaje Docente. 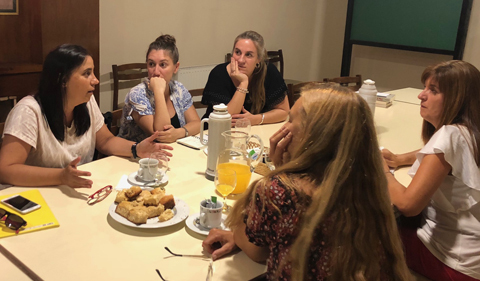 This FLC was created in 2017 thanks to the efforts of Gallego and Dr. Paola Piacenza (Instituto Superior San Bartolomé, Universidad Nacional de Rosario, Universidad Nacional de San Martín, Argentina), as an innovative approach for interdisciplinary collaboration and discussion regarding language teaching and learning in higher education across countries and for peers working in different institutions of higher education. With increasing immigration waves arriving in Argentina, non-native speakers of Spanish are enrolling at both higher education and at the K-12 levels. Institutions are facing a challenge for which they are not yet prepared and are required to design a plan of action to accommodate the linguistic and cultural needs of these students and to better serve them in their educational experience. For this, institutions first have to decide on a protocol of admission criteria, proficiency of language required, tests to be administered and an ongoing support plan to guide students in their integration to a Spanish-speaking education system. In addition, educators at both levels have to be offered the necessary training to work with non-Spanish speaker students. The Faculty Learning Community has strong potential to successfully tackle this complicated problem due in part to Gallego’s preparation as a language program director at Ohio University, whose College of Arts & Sciences notably promotes and defends the importance of language proficiency and global education in the liberal arts context. The FLC has six active members: Gallego and Piacenza, who are the FLC leaders, as well as Verónica de la Encina (Instituto Superior San Bartolomé, Argentina), Adriana Ferrandis (Escuela Superior de Comercio-Universidad Nacional de Rosario / Instituto Superior San Bartolomé, Argentina), Marcela Alemandi(Colegio San Bartolomé, Argentina), and María Rosario González (Escuela Superior de Comercio-Universidad Nacional de Rosario, Argentina) and has an active agenda for this year. The proposed activities include: approximately 10 hours of member interaction and research discussion, five hours of lectures and research talks, and six hours of workshops.